I responded to a request for help from clients in Northeast Portland who were concerned their crape myrtle trees planted two years ago were not healthy because they didn’t flower. They had done their research on crape myrtle but unfortunately not from a source familiar with their trees cultural needs or growth patterns here in the Willamette Valley. Let me knock a few myths out of the way to save you the same unease and help get our crape myrtle trees off to a good start. 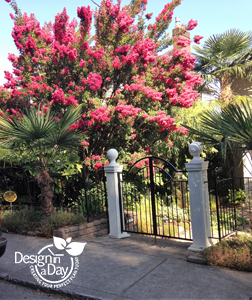 Crape myrtle are drought tolerant so don’t ever water them. Not so! Latest wisdom is to water them deeply with a drip irrigation or soaker hose once every 10 days. Touch the soil with your hands down a few inches to ensure you are not over watering. It should be moist and then as you get closer to the time to water again it should be almost dry. When they have been growing for ten years in your landscape they might become very low water needs. 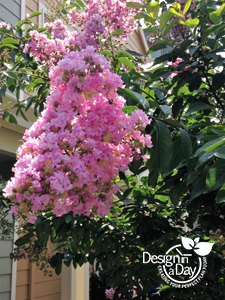 I like to design plant companions for the crape myrtle that have the same water needs. In this garden I have crape myrtle with Chinese Camellia – Camellia sasanqua ‘Yuletide’ and American Switch grass-Panicum virgatum ‘Shenendoah’. The clients added ground cover sedum. None of the plants near the tree need to be watered more than once a week ever after except perhaps for their first summer. A splash of hose water once a week is not at all what I am talking about, I am talking about slowly applied water and preferably drip system or soaker hose. Fertilize if you want a lot of flowers, that’s true for all plants, right? Not so! First off, nothing is true for all plants. There are plenty of plants that are harmed by fertilizer so tuck that behind your ear for a future conversation. We typically have fertile soil here in the Willamette Valley, so I would never fertilize crape myrtle beyond adding garden compost to the soil once a year as a top dressing. Adding fertilizer will work against your goal of having flowers. You must dead head (pinch off) all the spent flowers. No way!! If I had to deadhead crape myrtle flowers, it would take a bazillion hours and eventually a ladder. Nope, you don’t need to deadhead. When your tree is young, and you get a heavy crop of flowers you might want to thin out some flowers to prevent the young branches from breaking. 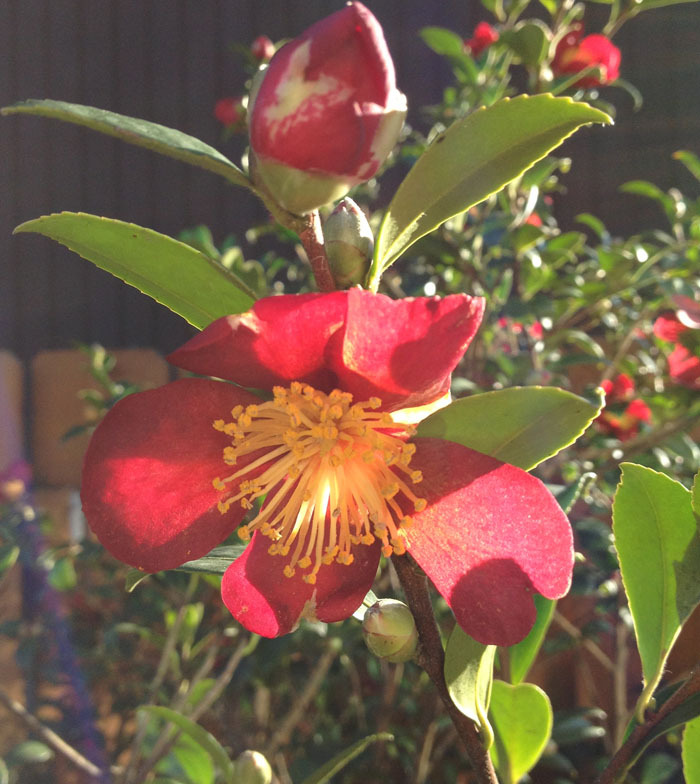 Flower timing will depend on our summer temperatures. True. It’s got to be hot enough and stay warm even at night to kick off the flowering of crape myrtle here in the Willamette Valley. If we have a cool June which we do sometimes, the flowers will be delayed until it’s been warm enough for long enough. For a deeper dig into crape myrtle read what Paul Bonine says in Pacific Horticulture magazine. He’s my expert! These clients came from California, a climate where plants grow fast. They were not familiar with the saying “Sleep-Creep-Leap” which describes typical plant growth for the first three years. Once roots are well established many plants grow fast and then after many years, they slow their growth. Just to be perverse, some plants grow slowly when young and then after they are a decade old, they grow much faster. It depends on the genetic makeup of each plant as to its growth rate. Generally, it takes 3 years of root growth in a plant to get to leap. Patience in our culture is a revolutionary idea. Contact me if you have more questions on your landscaping. You know how Facebook gives you that reminder about something you were doing a year ago today…………Well! Let me tell you, a year ago today I was sick with worry about my clients’ gardens because of the horrible, everlasting, record breaking, summer of hell. Do you remember? It was unseasonably and unreasonably hot early in our spring and it stayed that way all summer. I grew up here and I was in shock and a kind of grief actually. I missed our normal summer. As a Portland landscape designer I’m always trying to teach my clients about how to water. Did you know you can train your plants roots to grow more deeply? This has many health benefits and one of them is that the plants will be less stressed in high heat periods, another is they won’t need as much water which is nice for your water bill and for the environment in general. People who don’t know the tricks of proper watering really struggled with their plants and lawns and had many plant losses. Most were busy watering every day and either rotting their plants or doing such a light watering that the only thing that grew well was their water bill. A big shock for me was the number of clients whose lawns did not come back at all due to the extreme heat. They let their lawns go dormant, something that thrifty Portlanders have been doing for decades. The lawns did not come back with the fall rains. This had never happened to anyone I knew before. The spring of 2016 was very busy for Portland landscape design professionals. People were replacing their dead lawns and remodeling their landscapes. So now it is July of 2016 and it’s just starting to get hot. Whether your landscape is mature or has recently been installed it’s not too late to learn how to water properly and protect your investment. Let’s make your landscape beautiful. Get these easy and simple tips on how to keep your garden, patio, or other outdoor entertaining places beautiful. 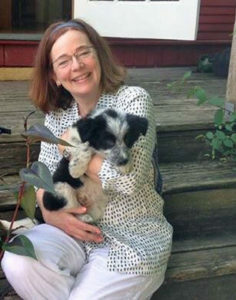 You’ll also receive my monthly newsletter and stay up to date on: design ideas, dog friendly designs, native plants, nurseries we love, upcoming garden events and tours.